Chairman of the Mo Ibrahim Foundation, Mohammed Mo Ibrahim has eulogized fallen world hero, Kofi Annan, whose sudden demise has left many down. Describing him as “a close friend, a counsellor and comrade in arms in the fight for better governance and rule of law in Africa”, Mo Ibrahim touted Mr. Annan’s contributions to maintaining peace, democracy and development in Africa and the world at large. “Today we lost a great African, a man who spent most of his life working for peace, democracy and development. He spent most of his working life at the UN retiring as Secretary-General in 2006. On retirement, Kofi dedicated his time and energy for Africa working for peace, human rights and climate justice. Besides his Foundation, he chaired the Elders, the Africa Progress Panel and the various missions he undertook searching for peace from Kenya, to Syria, to Myanmar. On a personal level, I have lost a close friend, a counsellor and comrade in arms in the fight for better governance and rule of law in Africa. Kofi was the first chair of our Prize Committee, and his contribution to our Board meetings were always invaluable. Our condolences to his wife Nane and his children”. Kofi Annan passed away Saturday morning in Switzerland after a short illness. "It is with immense sadness that the Annan family and the Kofi Annan Foundation announce that Kofi Annan, former Secretary General of the United Nations and Nobel Peace Laureate, passed away peacefully on Saturday 18th August after a short illness..." the Kofi Annan Foundation in a tweet said. Tributes have poured in from different angles; institutions and personalities worldwide following his demise. Following his graduate studies in Geneva, Annan joined the staff of the World Health Organization (WHO), a branch of the United Nations. He served as an administrative officer and as budget officer in Geneva. Later UN posts took him to Addis Ababa, Ethiopia, and New York City, New York. Annan always assumed that he would return to his native land after college, although he was disturbed by the unrest and numerous changes of government that occurred there during the 1970s. Annan became the Alfred P. Sloan fellow at the Massachusetts Institute of Technology. At the end of his fellowship in 1972, he was awarded a master of science degree in management. Rather than return to Ghana upon graduation, he accepted a position at the UN headquarters in New York City. In 1974 he moved to Cairo, Egypt, as chief civilian personnel officer in the UN Emergency Force. Annan briefly changed careers in 1974 when he left the United Nations to serve as managing director of the Ghana Tourist Development Company. 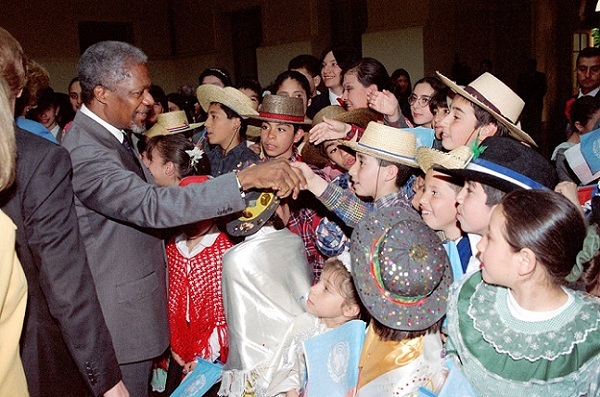 Annan returned to international diplomacy and the United Nations in 1976. For the next seven years, he was associated with the Office of the United Nations High Commissioner for Refugees in Geneva. He returned to the UN headquarters in New York City in 1983 as director of the budget in the financial services office. Later in the 1980s, he filled the post of assistant secretary-general in the Office of Human Resources Management and served as security coordinator for the United Nations. In 1990, he became assistant secretary-general for another department at the United Nations, the Office of Program Planning, Budget, and Finance. In fulfilling his duties to the United Nations, Annan has spent most of his adult life in the United States, specifically at the UN headquarters in New York City. 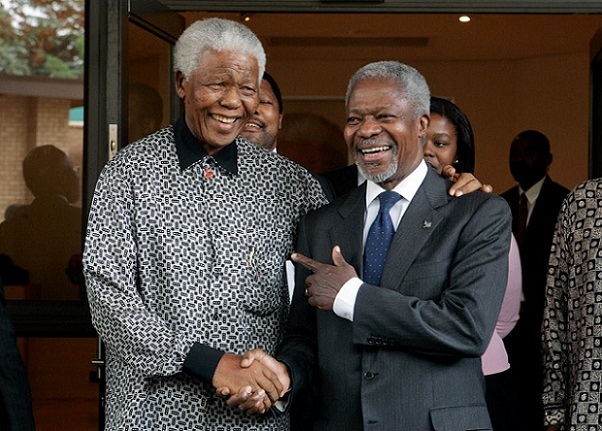 Annan had by this time filled a number of roles at the United Nations, ranging from peacekeeping to managerial, and the 1990s were no different. In 1990 he negotiated the release of hostages in Iraq following the invasion of Kuwait. Five years later, he oversaw the transition of the United Nations Protection Force (UNPROFOR) to the multinational Implementation Force (IFOR), a UN peacekeeping organization. In this transfer of responsibility, operations in the former Yugoslavia were turned over to the North Atlantic Treaty Organization (NATO). In recognition of his abilities, Annan was appointed secretary-general, the top post of the UN, by the UN General Assembly in December 1996. He began serving his four-year term of office on January 1, 1997. Joining him was his second wife, former lawyer Nane Lagergren of Sweden. She is the niece of the diplomat Raoul Wallenberg (1912–c.1947), who saved thousands of European Jews from the German Nazis during World War II (1939–45), when American-led forces fought against Germany, Italy, and Japan. Annan and Lagergren were married in 1985. The couple has one child. Annan's code of soft-spoken diplomacy was given a boost by the outcome of his talks with Saddam Hussein in 1998. UN observers wait to see how additional crises will be handled by the gentle but determined man from Ghana. In the summer of 2001, the United Nations unanimously appointed Kofi Annan to his second five-year term as secretary-general. On October 12, 2001, the Nobel Peace Prize was awarded jointly to the United Nations and Kofi Annan. The Nobel citation pointed out that Annan had brought new life to the peacekeeping organization, highlighted the United Nations's fight for civil rights, and boldly taken on the new challenges of terrorism and acquired immune deficiency syndrome (AIDS; a disease of the immune system).